Inducted 2001. Ranks No. 3 On Boys Basketball All-Time Scoring List. Class of 1972. Despite playing just two full seasons on the varsity basketball team, Pieper left his mark as one of the greatest big men in school history. 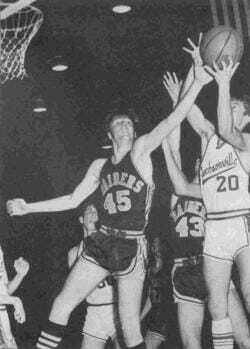 Pieper, a 1972 graduate of Catholic Boys, led the Raiders to a 25-4 record as a junior. He led the team in scoring (18.5 points per game), rebounding (9.4 rebounds per game) and field goal percentage (59 percent). CB defeated Quincy High School 76-70 to win the regional tournament, then went on to win the sectional before losing to Kewanee 60-59 in the single-class super-sectional. As a 6-foot-6 senior, Pieper led the Raiders to a 19-13 record. Participating in the first two-class state tournament, CB lost to eventual champion Lawrenceville 57-56 in the Class A quarterfinals. Pieper averaged 26.2 points, scoring a school-record 842 points, and 15.8 rebounds and was named to the Rockford Morning Star Class A all-state team, the Chicago Daily News Class A all-state team and the Associated Press Class A all-state team. He also earned special mention on the Champaign News-Gazette single-class all-state team, and was named to the United Press International all-Class A tournament first team. Pieper’s 1,382 career points ranks him third in school history behind Bill Kurz (2,110 points, 1959 grad) and Marty Bernbrock (1,533 points, 1967 grad). He holds the single-season and career rebounding marks as well. Pieper went on to play at Southeastern Louisiana University. He was a four-year letterman and two-year starter, averaging 6.4 points and 2.9 rebounds as a junior and 7.8 points and 4 rebounds as a senior. Pieper, who works for Marathon Oil, now lives in Ponchatoula, La. He and his wife Terri have a daughter, Rachel, and a son, Ben. Living in the deep south, I always look forward to coming home and visiting family and friends — but I especially look forward to visiting during basketball season. I was fortunate to have Mr. Bob Morris and Mr. Paul Holtschlag teaching the fundamentals at St. John’s Catholic School. They helped set the stage for the most successful career any high school athlete could hope for. Headed up by Coach Bob Bender, we made it to the Sweet 16 my junior year and the Elite 8 my senior year. I wish to thank the coaches for the opportunities they gave me. This made it possible for a successful college career. Thanks to all involved with the Hall of Fame Committee for awarding me this honor. Thanks also to my parents, Merle and Betty Pieper, and my wife Terri for their support and encouragement. A special thanks goes to my teammates for their efforts and sacrifice that made this honor possible.